Russian scientist Yu.M. Galaev published a paper back in 2002 which is destined to become a seminal work. This paper confirms the experimental work of Dayton Miller, who used a better interferometer in a more sensible location than that used by Michaelson and Morley in their underwhelming 1887 experiment, misrepresented as a null result and disproof of the existence of the ether, a transmissive medium pervading space. Miller and his work were subjected to a rather inept hatchet job by his former assistant Robert Shankland. R.S. Shankland, S.W. McCuskey, F.C. 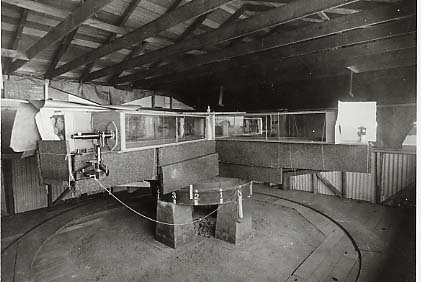 Leone and G. Kuerti, “New Analysis of the Interferometer Observations of Dayton C. Miller”, Reviews of Modern Physics, 27(2):167-178, April 1955. Shankland was rewarded for this infamy with a string of audiences with Einstein, and a well paid job as a pen pusher in the nuclear industry. Miller’s work, which ran from 1906 through the mid-1930s, most strongly supports the idea of an ether-drift, of the Earth moving through a cosmological medium, with calculations made of the actual direction and magnitude of drift. By 1933, Miller concluded that the Earth was drifting at a speed of 208 km/sec. towards an apex in the Southern Celestial Hemisphere, towards Dorado, the swordfish, right ascension 4 hrs 54 min., declination of -70° 33′, in the middle of the Great Magellanic Cloud and 7° from the southern pole of the ecliptic. (Miller 1933, p.234) This is based upon a measured displacement of around 10 km/sec. at the interferometer, and assuming the Earth was pushing through a stationary, but Earth-entrained ether in that particular direction, which lowered the velocity of the ether from around 200 to 10 km/sec. at the Earth’s surface. Dayton Miller, “The Ether-Drift Experiment and the Determination of the Absolute Motion of the Earth”, Reviews of Modern Physics, Vol.5(2), p.203-242, July 1933. This figure of 208km/s agrees well with estimates of the velocity of the solar system through space made by other means. Recently, Nobel laureate Maurice Allais has done extensive study of Miller’s results, and has concluded in his abstract: “It is utterly impossible to consider that the regularities displayed in Miller’s interferometric observations can be explained by temperature effects. As a result the light velocity is not invariant whatever its direction and consequently the principle of invariance of light velocity on which fundamentally does rest the special theory of relativity is invalidated by the observation data.” Allais adds: “Shankland’s and et al’s conclusions on the temperature effects are based on shaky hypotheses and reasonings. They are totally unfounded” (L’origine des régularités constatés dans les observations interférométriques de Dayton C. Miller (1925-1926): variations de température ou anisotropie de l’espace,” C. R. Academy of Science, Paris, t. 1, Sèrie IV, p. 1205-1210, 2000, translated from the French, p. 1205). In addition to Allais, Reginald T. Cahill points out that the non-interferometer coaxial cable experiments of DeWitte (1991) and Torr and Kolen (1984) show results of motion equal to Miller’s 1925 data. In the midst of analyzing the results Cahill concludes: “So the effect is certainly cosmological and not associated with any daily thermal effects, which in any case would be very small as the cable is buried” (Novel Gravity Probe B Gravitational Wave Detection, Flinders University, August 21, 2004, pp. 16-17). How much does it slow light down? Can it transmit the gravitational force faster than light? What are the implications for Big Bang models? Answers on a postcard, or just post your thoughts below.